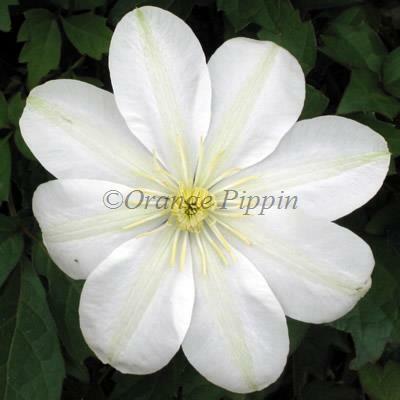 The elegant and unusual colour of this Clematis make it a very popular choice. The flowers of 'Guernsey Cream' are creamy-yellow with a green stripe down each of the petals and have pretty yellow centres during May and June, then again in September. This attractive non-evergreen climber can be grown up a trellis, pergola, trained up natural supports such as a large shrub or tree, along a fence, wall or planted in a container on the patio. Clematis 'Guernsey Cream' was raised by Raymond Evison of Guernsey Clematis Nursery.